Are you interested in being discovered by people looking for exactly what you offer? Well in 2018, video is the best way to do that, especially when it’s the video of a trusted vlogger endorsing you! I know how to precisely communicate with Google and Google-owned YouTube so that my videos are shared to the right person at the right time … exactly when they’re searching and researching online. 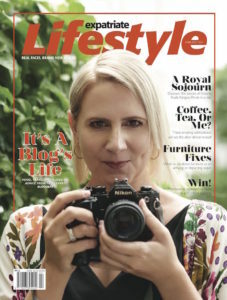 Chosen for Expatriate Lifestyle Magazine cover (Feb 2017 issue) as a top expat blogger in Malaysia. My passion is sharing wonderful places to eat, drink, stay, and explore on my YouTube channel Wander with Angela. And I have so much fun helping people make travel and buying decisions. It’s a huge source of pride for me that many of my videos are #1 of YouTube. It’s not because I have a have a huge number of subscribers (because I don’t) but because my videos are easy to find when people ‘search’ and they show up high in the rankings.